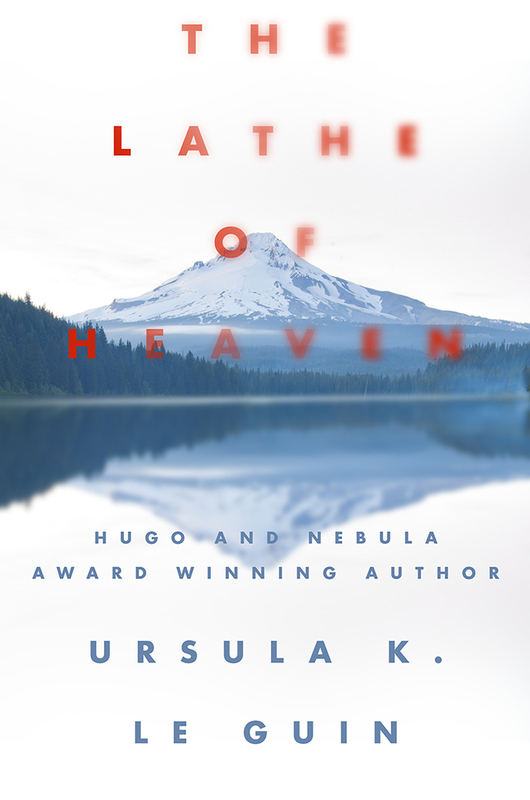 Ursula K. Le Guin’s science fiction novel The Lathe of Heaven was released as an ebook for the first time last month, and today I have an excerpt from chapter one to share with you as well as a chance to win the ebook! 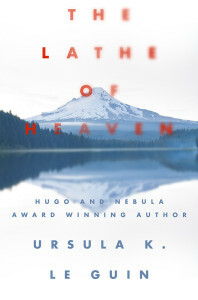 Like many of Ursula Le Guin’s novels, The Lathe of Heaven is an award winner: it won the Locus Award for Best Novel in 1972, and it also had the distinction of being nominated for both the Hugo and the Nebula Awards. I hope you enjoy reading a sample from this acclaimed novel, and if you want to read more, there is more information about the giveaway after the excerpt. For the first time as an eBook, a science fiction classic by one of the greatest writers in any genre. Confucius and you are both dreams, and I who say you are dreams am a dream myself. This is a paradox. Tomorrow a wise man may explain it; that tomorrow will not be for ten thousand generations. Current-borne, wave-flung, tugged hugely by the whole might of ocean, the jellyfish drifts in the tidal abyss. The light shines through it, and the dark enters it. Borne, flung, tugged from anywhere to anywhere, for in the deep sea there is no compass but nearer and farther, higher and lower, the jellyfish hangs and sways; pulses move slight and quick within it, as the vast diurnal pulses beat in the moon-driven sea. Hanging, swaying, pulsing, the most vulnerable and insubstantial creature, it has for its defense the violence and power of the whole ocean, to which it has entrusted its being, its going, and its will. His eyelids had been burned away, so that he could not close his eyes, and the light entered into his brain, searing. He could not turn his head, for blocks of fallen concrete pinned him down and the steel rods projecting from their cores held his head in a vise. When these were gone he could move again; he sat up. He was on the cement steps; a dandelion flowered by his hand, growing from a little cracked place in the steps. After a while he stood up, but as soon as he was on his feet he felt deathly sick, and knew it was the radiation sickness. The door was only two feet from him, for the balloonbed when inflated half filled his room. He got to the door and opened it and went through it. There stretched the endless linoleum corridor, heaving slightly up and down for miles, and far down it, very far, the men’s room. He started out toward it, trying to hold on to the wall, but there was nothing to hold on to, and the wall turned into the floor. The elevator guard’s face was hanging above him like a paper lantern, pallid, fringed with graying hair. He was back on his bed in his room. “Couldn’t find the fit,” he said, meaning that he had been trying to lock the door through which the dreams came, but none of the keys had fit the lock. “Medic’s coming up from the fifteenth floor,” Mannie said faintly through the roar of breaking seas. He was floundering and trying to breathe. A stranger was sitting on his bed holding a hypodermic and looking at him. It was hard to breathe, but the sickness was gone, leaving only an awful weakness. The medic scribbled on a paper on his knee. “He borrowed my card,” the elevator guard said. “Yeah. Mannie Ahrens, 247-602-6023.” The medic’s pen went scribble scribble. “I can’t,” he said, meaning that he could not let Mannie lie for him, could not stop him from lying for him, could not take it easy, could not go on. Courtesy of Diversion Books, I have one ebook edition of The Lathe of Heaven to give away! This giveaway is open internationally, and the winner has a choice between ePub and Mobi formats. Giveaway Rules: To be entered in the giveaway, fill out the form below OR send an email including the format of your choice (ePub or Mobi) to kristen AT fantasybookcafe DOT com with the subject “The Lathe of Heaven Giveaway.” One entry per person and one winner will be randomly selected. Those from any country in the world are eligible to win this giveaway. The giveaway will be open until the end of the day on Monday, May 19. « Guest Post by Freda Warrington: Vampire Fiction–Where Next?